Algorithmic Trading Strategies: Seeking Higher Profit Returns This Holiday Season? Use These Effective Algo Trading Strategies! The holiday season is finally here. With all the shopping, gift-giving, cooking, and hosting that takes place this time of year, there’s a good chance that your wallet will be much lighter when it’s all said and done. In fact, according to a study by the National Relief Federation, the average American will spend $700 on holiday gifts and other holiday-related goodies this year, totaling more than $465 billion! 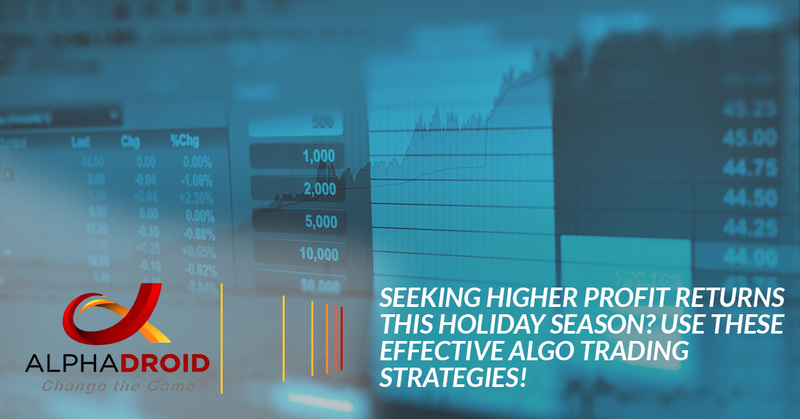 Use Algo Trading For Higher Profits This Holiday Season! You’re not the only one who wants to make some extra money during this time of year, as it certainly can come in handy. Many people, specifically investors and traders, are making money using algorithmic trading. If you have followed our blog, you likely know a thing or two about algo trading, but if you’re just dwelling into automated trading, we’ll sum it up as fast as possible; Algo trading is one of the most advanced — if not the leading — form of trading in today’s modern world. Algorithmic trading is a system through which trading is done automatically through computers that are set up with a predefined set of rules to execute trades based on said instructions, or algorithm. Algorithmic trading technology makes the process of trading very fast, accurate, and without the risks of human error. Trades can be executed precisely at the price and volume specified in the predefined set of rules, and the time takes to complete each trade is minimal. This can significantly help in reducing the losses that are often a result of the time lag between placing orders and the actual execution of the order. Although trades are executed by computer systems, the strategies to input into the computer algorithms are created by the trader or investor. In fact, traders decide what whether the computer buys or sells, at what price, at what volume, and at what time. So, algo trading strategies play a significant role in the profits and efficiency that can be obtained from algo trading. If you want to make some extra income this holiday season, algo trading is a great way to do so. Before you begin automating your trading, it is essential to have a solid understanding of how it all works. If you’re new to algo trading, check out our Quick Beginners Guide. To help ensure you are more likely to make higher profit returns when trading, in this article, we are going to share some of the best algo trading strategies to use. Momentum and Trend following trading remains one of the most popular trading strategies among retail traders in nearly all markets. These algo trading strategies are some of the simplest and most widely used by traders. Both trading strategies consider the historical and current price data to analyze if the trend is inclined to continue or not and makes decisions accordingly. Though the two may initially appear similar, there are real differences that exist between the concepts of momentum and trend. Momentum trading relies on the assumptions that prices respond to the strength of their supply and demand inputs. Momentum trading is typically used to capture strong moves in short periods of time, usually for not more than a few hours or a few days. Generally, momentum traders are very focused on only a few trades at a time, at most. Trend trading involves algorithms monitoring the market for indicators to execute trades. Typically, these trades use technical analysis and market patterns and indicators to make trade decisions. The goal of this strategy is to purchase assets when prices break noteworthy resistance levels and sell short assets which fall below significant support. One of the more efficient algo trading strategies, the weighted average price strategy can either be based on time-weighted average price or volume-weighted average price. Generally, orders are large, however, they are not released all at once. These orders are released in small sections using either using certain time slots between a start and end period or the historical volume stock profiles. The purpose is to execute orders as accurate as possible to the volume weighted average price or the time-weighted average price. Mean reversion trading strategies exploit the tendency of many asset prices to degenerate to the mean after periods where they become either over purchased or oversold. Investors following this strategy generally assume that the price of the stock will eventually revert back to its long-time, average price. This strategy determines the upper and lower price limit of a stock and the algorithm works to execute orders when the price is higher than the normal range. They will purchase assets when they trade at the lower end of a trading range. And, when the assets approach the center of the trading range or a moving average, investors choose to sell them. For traders interested in short-term trading strategies, statistical arbitrage is based on trading opportunities that occur due to price inefficiencies and the misinterpretation of security prices. This generally occurs in securities that are related to each other or have similar natures. However, these two issues are corrected in a short time duration and therefore makes this an efficient way to catch them and make more profits. Statistical arbitrage algorithms involve sophisticated mathematical models that detect price inefficiencies as soon as possible and execute the trade before the prices get corrected — something a human trader will not have the ability to perform. There are a variety of algo trading strategies which can be used. The algorithms in these specific strategies are designed in ways that are compatible with the strategy selected by the trader and the orders are executed accordingly. By using these strategies properly, you can experience higher profit returns, just in time for the holidays. If you want to get the most out of these trading strategies, using AlphaDroid, a premier investment portfolio software, uses various algorithmic trading strategies to help predict the market by following trends. AlphaDroid trading strategies consist of a selection of up to 12 ticker symbols with a few trading instructions, crash protection options, and performance testing options. These algorithmic trading strategies help advisors analyze, construct, and compare investment portfolios, giving investors the opportunity to optimize returns by moving to wherever the profits are flowing. Interested in learning more about AlphaDroid and how it can help investors attain larger returns in time for the holidays? Visit our site today!